There’s surely one in every family – that is, a kid who doesn’t like ‘bits’ in their food – and by bits I mean those pesky, minuscule sized pieces of healthy fruit or vegetable parents the world over are hoping their offspring don’t notice. 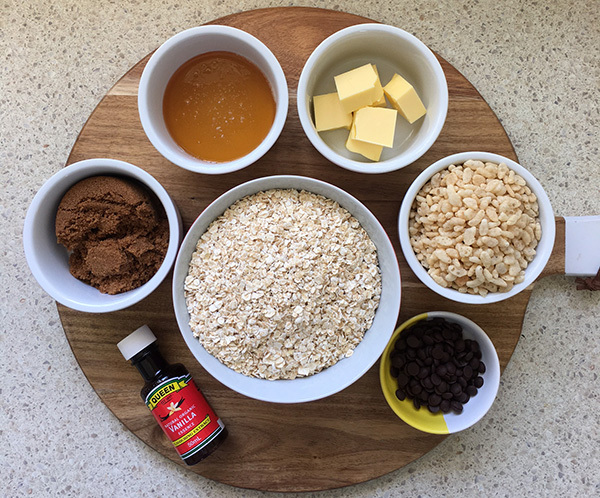 With that in mind, I give you a recipe for plain (ok, there’s choc-chips, so not completely plain), albeit delicious, muesli bars. And better yet, there’s no baking involved! My kids fall in to two camps when it comes to muesli bars – the elder two love a muesli bar jam packed with fruit and seeds while the youngest has ‘simpler’ tastes. And by simpler, I mean he’s completely fussy. 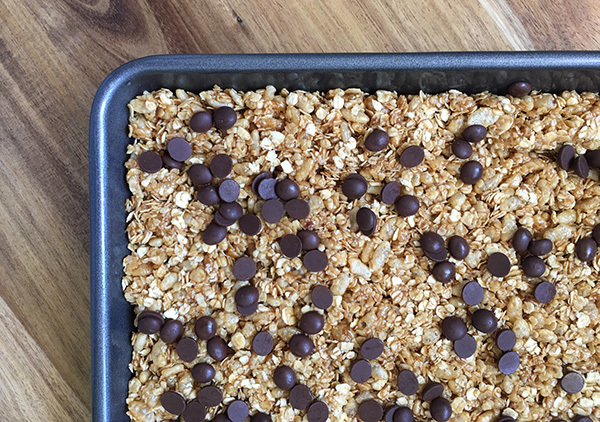 I recently discovered the No-Bake Chocolate Chip Granola Bar recipe from Lauren’s Latest and it’s destined to be a lunch box winner in our home. Lightly grease a 30cm x 20cm slice tin. Combine quick oats and Rice Bubbles cereal in a large bowl, set aside. In a small saucepan over medium heat, melt butter, brown sugar and honey, stirring, until it comes to a slight boil. Reduce the heat and cook for two minutes. Add the vanilla and stir. 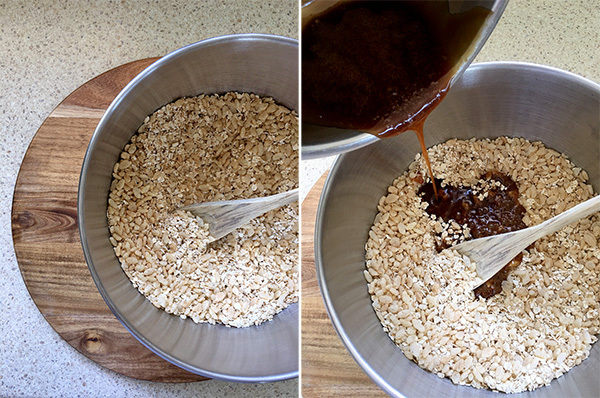 Pour the sugar/butter/honey/vanilla mix into the cereal/oats mix and mix together until all cereal and oats have been coated in sticky golden goodness! Press the combined mix firmly into the slice tin so that the muesli bars will be a couple of centimetres thick. You may need to ‘short fill’ the tin, pushing the mix into one side only – and yes, press it in hard so it sticks together when it sets. 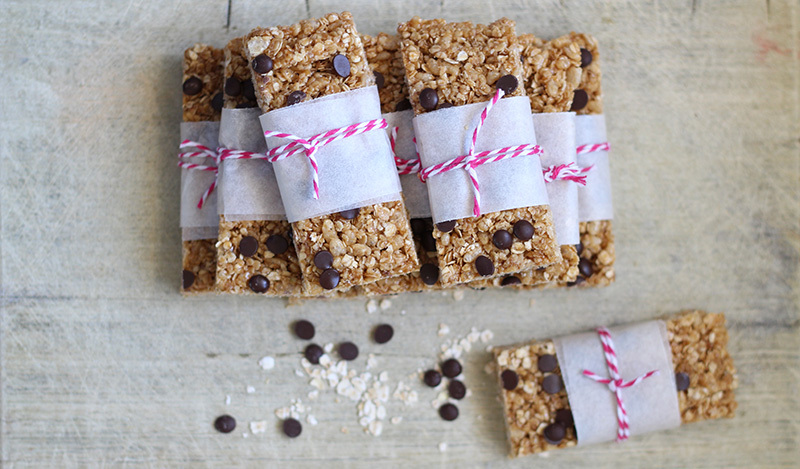 Sprinkle your freshly pressed muesli bar slab with the chocolate chips and press them in lightly with the palm of your (cool) hand. Cool on a counter top in the tin for a couple of hours or if patience isn’t your virtue, pop the tin in the fridge for an hour before cutting it into bars. This recipe makes 10 bars. Do you have a recipe that’s a hit every time? We want to know about it! You can send us your favourite recipes, and while we can’t reply to each submission, we’ll certainly let you know if your recipe is chosen to be shared with the Babyology community. We can’t wait to hear from you and look forward to seeing your culinary creations!